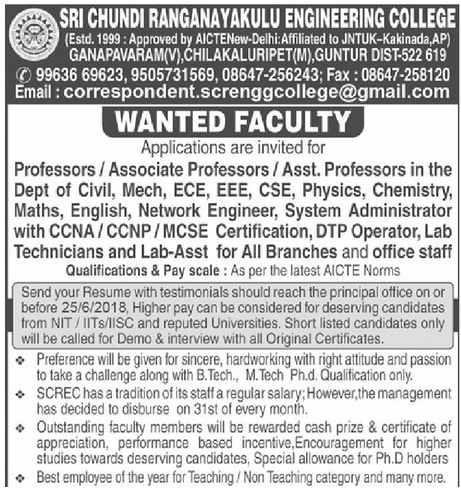 Sri Chundi Ranganayakulu Engineering College, Guntur has advertised in EENADU newspaper for the recruitment of Professor/Associate Professor/Assistant Professor jobs vacancies. Interested and eligible job aspirants are requested to apply with in 25th June 2018. Check out further more details below. About College: Sri Chundi Ranganayakulu Engineering College popularly known as SCREC, was established in the year 1999. It is the flagship institute among the various educational institutions started by the well known philanthropist Sri Chundi Ranganayakulu whose primary objective is to establish and manage a variety of educational Institutions with high quality and to produce quality human resources for the service of the society. The College is situated in a spacious 26 acres of land with a built up area of 18006 Sq.m. It has five branches in its undergraduate program, i.e., E.E.E., M.E., E.C.E. C.S.E. and Civil along with the Post Graduate MBA, MCA and MTECH courses.